Are you planning to visit family or friends and eat leftovers from past holidays? 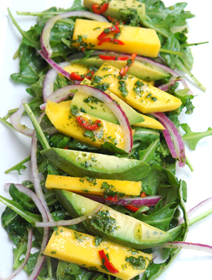 Well, you can twist their flavor with this delicious salad recipe: Arugula salad with mango, avocado and red onions tossed with spicy orange vinaigrette! Combine all the ingredients for the salad dressing in a jar, close it tight and shake until the ingredients are well mixed. It’s delicious, but also it’s great for those who are trying to loose weight and burn fat. Cancer fighting Powerfood, it’s high in fibre and antioxidants, and also rich in glucosinolates, studies show may reduce the risk of developing lung, prostate, breast, and pancreatic cancer. Rich in chlorophyll which can help to prevent liver and DNA damage from aflatoxins. Good for bone health. Vitamin K is needed for bone health; it is needed for the absorption of calcium into the bones and teeth. Helps reduce inflammation in the body and gives you energy and mobility. The fiber content helps clean out the colon promoting healthy bowel movements. Protects the aging brain from cognitive decline. The extra benefit is that 2 cups of arugula contain only 80 calories, making it a good choice for those on a diet. Arugula has been used as an aphrodisiac since the first century. Research has shown us that the trace minerals and antioxidants in dark, leafy greens are essential for our sexual health. Prevents Cancer; antioxidant compounds in mango fruit have been found to protect against colon, breast, leukemia and prostate cancers. Lowers Cholesterol; the high levels of fiber, pectin and vitamin C help to lower serum cholesterol levels, specifically Low-Density Lipoprotein (the bad stuff). Eye Health; One cup of sliced mangoes supplies 25 percent of the needed daily value of vitamin A, which promotes good eyesight and prevents night blindness and dry eyes. Helps in Diabetes, because mango help normalize insulin levels in the blood. So, it’s not only a delicious salad, your body will get a lots of benefits from this one too! Enjoy! Until the next time.